Sara had just graduated high school when Like a Lion launched their summer camp. She was headed to Cedarville in the fall of 2012, but was a committed staff member in the summer of 2012. She continued to help grow Like a Lion, even as she was away at college. She came back every break to serve the students during the after school program. Rachel was a student at IUPUI when Like a Lion was founded. Right as the summer camp began, Rachel found out she was pregnant. Though the timing was less than ideal for her to be on the founding team, Rachel was dedicated to loving the Like a Lion kids. Her daughter has been major part of the Like a Lion family since the beginning. Rachel served in the summer camp and after school program (second semester) during the first year. Maddie was heading into her senior year when Like a Lion was founded. She spent her summer serving Like a Lion and single handedly launched our after school program in the fall of 2012. She operated it solo for the first semester and continued to serve until she left for college in 2013. Maddy too has just graduated from high school when she was a part of the launch of Like a Lion. She served on staff for the first summer. If the fall of 2012, she left for college at IU. 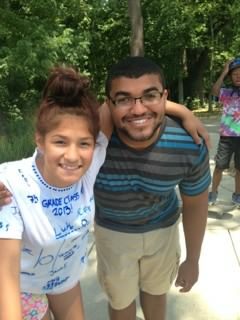 After only one semester, she realized her heart was with the Like a Lion kids and transferred to IUPUI to help create/continue Like a Lion’s after school program and summer camp. Mo had just graduated high school when we began volunteering at Like a Lion. He was one of the first volunteers Like a Lion ever had. He served as a dedicated volunteer the entire summer. He helped the founders create structure and was a favorite amongst the students! Terrance was also a recent high school graduate when he began volunteering. He too was one of the first volunteers of Like a Lion. He regularly volunteered during the summer of 2012. He was consistently making the students laugh and providing leadership! Like a Lion served 17 kids our first summer. All of these kids were a part of our previous program and came to Like a Lion once that program ended. There were not any paid staff during this year but the 4 founders were dedicated to serving the students, not matte what it took. Many other partnered alongside as volunteers. We signed up for Kids Bowl Free and we were able to do field trips to the bowling alley. Through a partnership with Carmel Cru, we were able to get Panera bagels donations each week. A lot of growing pains happened, but Like a Lion was successful in providing both a summer camp and after school program.